Mounting Width 19" and 23" 19" EIA, 23" and 35" 19" EIA for 3"-deep channel 19" EIA, 23" and 35" for 6"-deep channel 19" EIA 23" and 35" 35" 19” EIA and 35"
Channel or Trough Depth 3" or 6" 3" 3" and 6" 3" 6" 5-1/2" 6"
CPI’s Seismic Frame® Two-Post Rack is designed specifically to support network equipment in areas with seismic activity. When earthquakes occur, equipment racks move back-and-forth with the building causing violent vibration through racks and equipment. An earthquake can easily damage or destroy non-seismic racks and equipment that are not carefully braced. The welded, steel Seismic Frame Two-Post Rack resists the swaying motion caused by earthquakes to reduce the amount of vibration transferred through the rack to equipment and is less likely to be damaged during a seismic event, which means faster network recovery. The Seismic Frame Two-Post Rack supports 19” EIA-310-D compliant or 23” wide equipment with two pairs of mounting rails that can be spaced 6” (150 mm) or 3” (80 mm) apart. The mounting rails are marked and numbered with RMU spaces and can be attached so that numbering starts at the bottom or top of the rack mount space. Choose threaded or square-punched mounting rails with a painted or zinc-plated finish. The mounting holes in threaded mounting rails are tapped with #12-24 threads to speed installation of panel-mount equipment with #12-24 screws. The square-punched rails accept cage nut hardware allowing you to change threads at each RMU to match equipment mounting requirements. CPI’s Seismic Frame Two-Post Rack ships fully assembled and includes a Two Mounting Hole Ground Terminal Block for bonding the rack to the Telecommunications Grounding Busbar and 50 each equipment mounting screws or cage nuts and screws. The rack is rated for a 1,000 lb (453.6 kg) seismic Zone 4 load per Section 4.4 of the Telcordia® Technologies, Inc. GR-63-CORE Network Equipment Building Systems (NEBS) requirements. Universal Rack is a heavy duty storage solution for patch panels and network switches and can be used with shelves to hold computer servers. Universal Rack uses less floor space than a cabinet or a four-post rack. Use Universal Rack in telecommunications rooms or equipment rooms to save floor space and hold heavy equipment. Universal Rack meets project specifications. Universal Rack holds 1,500 lb of equipment and is available UL Listed as a communications circuit accessory. Universal Rack supports 19", 23" or 35" wide rack-mount equipment and shelves and is available in several heights. Equipment attaches to the front or rear of the 3" deep vertical mounting channels with screws. Equipment mounting positions are marked and numbered making it easy to position and install equipment or shelves. Racks deliver unassembled in a compact carton. Universal Rack is easy to assemble. Components bolt together with included hardware. Assembly holes in the rack uprights are threaded. Assembly takes approximately 10 minutes. Two-post racks must be secured to building structure. 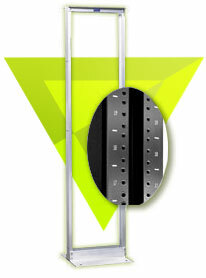 Universal Rack has pre-punched base angles making it easy to attach the rack to the floor. Use a CPI installation kit for wood, slab or raised floors. Most Universal Rack applications require cable management. 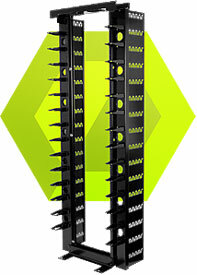 Vertical cable managers attach directly to the side of Universal Rack. CPI cable managers organize cables by-rack-mount-space simplifying future moves, adds and changes to the network. The best solution includes horizontal managers in between patch panels and network switches to fan patch cords into individual port connections. 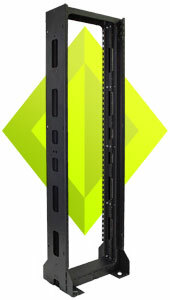 Supports 19" rack-mount equipment designed for two-post panel mounting like patch panels and network switches or use with shelves to support computer servers. Delivers unassembled in a single carton —quick and easy bolt-together assembly takes less than 10 minutes. Use with vertical and horizontal cable managers to support interconnect and network equipment in telecommunications rooms, equipment rooms and data centers. Use with shelves to support equipment. The Standard Rack is a high quality, cost-effective storage solution for patch panels and network switches that uses less floor space than a cabinet or a four-post rack. The small 20.3"W x 15"D (516.1 mm x 381 mm) footprint makes Standard Rack the best choice in many telecommunications and equipment rooms, especially where floor space is limited. The Standard Rack meets project specifications, will hold 1,000 lb (453.1 kg) of equipment and is UL Listed as a communications circuit accessory. Support 19" EIA wide rack-mount equipment or shelves with the Standard Rack which is available in three heights. Equipment attaches to the front or rear of the 3" deep (80 mm) vertical mounting channels with screws. Mounting positions are marked and numbered making it easy to position and install equipment or shelves. Racks deliver unassembled in a compact carton, and are easy to assemble. Components bolt together with included hardware; assembly takes approximately 10 minutes. Two-post racks must be secured to building structure. The Standard Rack has pre-punched base angles making it easy to attach the rack to the floor using a CPI installation kit for wood, slab or raised floors. Because most Standard Rack applications require cable management, CPI’s vertical cable managers attach directly to the side of the Standard Rack. Vertical cable managers organize cables by rack-mount space simplifying future moves, adds and changes to the network. The best solution includes horizontal managers in between patch panels and network switches to fan patch cords into individual port connections. Supports 19" EIA rack-mount equipment designed for two-post panel mounting like patch panels and network switches. Easy positioning of equipment with marked and numbered rack-mount spaces. Quick attachment of equipment with threaded equipment mounting holes and included equipmentmounting screws. Delivers unassembled in a single carton—quick and easy bolt-together assembly takes less than 10 minutes. 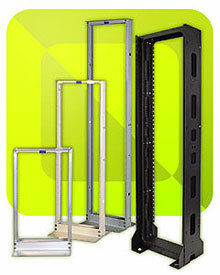 Quickly attach any CPI vertical cable manager to the side of the rack through pre-punched web channel holes. Floor-mount holes on the base angles make it easy to secure the rack to the floor with a concrete, wood or raised floor installation kit. Use Standard Rack with vertical and horizontal cable managers to support interconnect and network equipment in telecommunications rooms, equipment rooms and data centers. Use with shelves to support other equipment. Designed to maximize support of patch panels, the High-Density Patching Frame combines the benefits of CPI’s 2-post open racks and vertical cable management into a single package. The XLBET (Extra Large Building Entrance Terminal) 110A Block Mounting System has been designed for high-density, spacesaving 110A (with legs) style block mounting. The 8” W x 6.6”D large wire managers provide distinct vertical and horizontal cable and jumper pathways for efficient space usage. 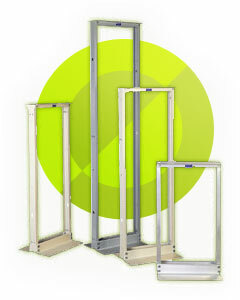 The basic frame (23” or 35”), mounting bars, and the small and large wire managers are available under one part number. The XLBET 110A Block Mounting System ships completely assembled for quick, easy installation. The single-sided 110 Customizable Frame supports up to 4500 pair while the double-sided model holds up to 9000 pair. Multiple racks can also be bayed together. The steel frame consists of three vertical channels and top and bottom panels. Openings between each channel provide space for vertical cable management. 110D Block Mounting Brackets are designed for wall- or rackmount, providing integrated wire management and mounting surfaces for 100 pair or 300 pair 110D blocks. Separate cabling and jumper paths allow for maximum cabling capacity and ease of installation. Four 600 pair Mounting Brackets will mount to each side of any 19”W CPI Rack. Four 900 pair or three 1800 pair Mounting Brackets will mount to each side of any 35”W CPI Rack. MDF 66 BLOCK MOUNTING SYSTEM 19" AND 35"
Use the MDF 66 Block Mounting System for main distribution, centralized equipment or PBX applications requiring a high-density, space-saving 66 Block Mounting System. The MDF 66 Block Mounting System includes a 19" wide or 35" wide 6" Deep Standard Rack and several 66 Block Mounting Brackets. Premise cables enter the top or bottom of the rack between the 6" deep rack channel uprights. 66-style blocks attach to the front of the block mounting brackets (mounting screws are included). Use the U-shaped cable rings on the top of the brackets to route jumper cords between blocks. Available in single-sided or double-sided configurations, the frame can be junctioned together in multiple frame line-ups. The MDF66 Block Mounting System is pre-assembled and ready-to-go right out of the box. Choose the 19" or 35" rack, single- or double-sided, in black, gray, white or clear (grained aluminum) finish. The MDF66 Block Mounting System is pre-assembled and ready-to-go right out of the box. Choose the 19" or 35" rack, single- or double-sided, in black, gray, white or clear (grained aluminum) finish.